Most businesses spend too much time trying to gain new customers and fail to recognize the immense goldmine that they have in their existing customers. The fact is that the people most likely to buy from you are those people who have already bought from you! That's why backend marketing can help to boost your profits, even when new customers are few and far between. As a strategy to survive and thrive in a recession, it's hard to beat backend marketing. Strategies are deceptively simple and work best when implemented with consistency. While it doesn't take much to ask someone if he/she wants a pair of socks to go with a set of shoes he/she just bought, if you don't have that step planned out, you can miss that opportunity. It works best when you use these strategies at specific times and quite consistently. When planning your sales funnel, you should include deliberate methods to sell backend offers. It shouldn't ever be an afterthought; it should be a carefully planned marketing strategy. It may look like a simple question or an additional ad that is carefully placed on a thank you form, but it's a planned attempt to get your visitors to open their wallets wider. Don't miss an opportunity to increase your bottom line, particularly when the customer is in the mood to buy – which is usually when they've just agreed to buy. By paying attention to your sales funnel and strategies, you can set up a maze of offers that are subtle yet powerful motivators to sell. A sales funnel is the way that you can get an unidentified visitor to self-identify himself/herself and to join your marketing program. The first step is to turn anonymous visitors into real live email addresses that have given you permission to contact them. Without knowing who is visiting your site, you'll never be able to execute a successful sales funnel. That's just the mouth of the sales funnel. After that, you should have some steps set up to place people in particular demographic groups that you then intend to market to in some way. Whether it is a new or an old customer, they should all be in some area of your sales funnel. Your sales funnel should include backend offers at regular intervals, in emails, in forms, in various types of promotions. It should include various email campaigns. It should track the sales of your offers and how to upgrade people to other lists if they selfidentify themselves as big spenders. When people first visit, your priority is to get them to register via a frontend offer. This can be a free report, ebook, discount coupon, or some other offer that is given to them in appreciation for subscribing to your email list. Once they've entered the mouth of your sales funnel, the double opt-in form, then you have a perfect right to market to them in any way that you choose, frontend or backend. The double opt-in form also works great as a way to start the process of marketing to new clients because it weeds out spammers and fake email addresses. In order to receive the freebie, the customer has to verify his/her email address by going to his/her inbox and clicking a link to verify. This then verifies the account, and he/she is fully registered and is sent to the download area where he/she can see the freebie. While your first few emails should remain friendly and casual, whatever it is that you've offered them as bait to sign up, it should include some backend offers. If it's a report, you should include a description on some good tools or services that you're selling or on other products, even affiliate offers. Ask for referrals too for anyone that might like a free copy of whatever it is that you are giving away. Next, add their name to a particular marketing campaign. If they haven't self-identified themselves yet, just add them to a generic email list for low-income offers and start to send out these emails once a week or as often as they allow you to. You can set this all up through AWeber.com to automate it. Once people are in a sales funnel and on an email list, you just continue to market to them per your plan until a sale is made. If they are your existing customers, they've already identified who they are and how much they are willing to spend. If they spend a lot, put them on an email campaign that offers them larger frontend and backend offers. If you don't know whether they'd be willing to spend more, offer them a low-income frontend offer with a high-income backend offer, just in case. If you want to do backend offers, you have to have many products in your inventory. They don't specifically have to be your own products; they can be affiliate products. However, you need sufficient inventory to mix and match your offers so that people won't get tired of seeing the same offer every time and get more resistant to being marketed to out of pure boredom. In your inventory should be three categories of products: low-, mid-, and high-range products. The reason for this is that you are going to cycle through the entire line up of products in whatever demographic your customer is in. If they self-identify themselves as being willing to buy in the mid-range, then you can shift them out of the low-range products and start cycling them through the mid-range products, and so on. This three-tiered system works well because it allows you to keep track of what part of the sales funnel they are in, what they've already bought, and what you still need to market until it sells. After that, it's just a matter of learning when to give incentives to have them buy more on the backend. Some strategies work best with different tiers of products. You can't really do an immediate backend offer the moment someone buys a low-end product, unless it's very subtle, like something that is included within the content of a freebie. Otherwise, it's not enough time for customers on that tier to really ascertain the quality of your products and to trust that you will deliver what you say you will deliver. If that's the case, you might want to offer more significant freebies to move them up a notch, like an invitation to a teleseminar or a free coaching session. That way, they can test your products before you actually move into marketing to them for bigger amounts of money. Once you've gotten a mid-level product sale from a customer, you can start to offer them one-time offers on the backend. These offers are great deals for your regular customers, who now understand that you have good products and they have enough trust in you to purchase more. 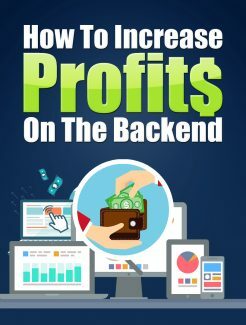 Once they've identified themselves in this category due to their moving into the mid-priced level of products, you can start to market the limited one-time backend offer. After the sale of a mid-priced product, send the customer to a sales page with some related product on it. Tell them that because they've bought a specific item, they are given this “one time” chance to make another complementary purchase at a discounted price. Make it clear that once they leave the page, that price will no longer be offered. Sweeten the deal by adding some bonuses to your special deal that are also included in your “one-time” offer. These bonus items will no longer be available for free with other packages unless they make this deal. Should they leave the page, the offer is gone forever and so is the discounted price. This really lights a fire under people's butts and is a great way to make use of a backend offer at just the right time. The customer who is led to this backend offer has already indicated that he/she is willing to buy mid-priced products from you, so money is not an issue. They probably are also highly interested in your lineup of products. They might decide to wait until they have more money to come back and buy some more from you later, but if you showed them how they would save tons of money from you by buying now, they are more likely to buy the one-time offer. In addition, one of the psychological triggers that people have is a fear of loss. If a deal is really good, they already trust you, and they know that they will most likely want this product in the future, the fear of loss will get them to buy now, knowing that that offer will never appear again and that they will only have themselves to blame for missing it. Instead of going to a totally separate page upon buying the mid-level product, you can include the one-time offer on your thank you form as a special way to thank people for patronizing your site. This is also a nice way to show people that you are paying attention to your buyers and rewarding them for their loyalty. Along with the regular lineup of products in your sales funnel, you should set up multiple bonus offers that you can offer on the backend at various times. You can offer them in an email that confirms a download of a product. You can offer them in email campaigns at specific times when some action is taken, whether it's joining a forum or participating in a survey. Once you have someone's attention, it doesn't hurt to offer him/her something special by way of a thank you during his/her interaction with you.